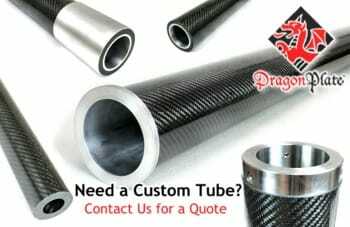 DragonPlate offers a wide range of carbon fiber tubes for many different applications. Our tubes are manufactured by us here in the USA, giving us complete control over the characteristics and quality. If you do not see what you need, contact us to discuss manufacturing tubes to your custom specifications. See also our Tube Connector Systems and Kevlar Tubes. Roll wrapped prepreg carbon fiber tubes are constructed using multiple wraps of twill and/or unidirectional fabrics. Rolled tubes are ideal for applications that require the highest bending stiffness and lowest weight, such as automation robotics, telescoping poles, idler rollers, and UAV components. Additionally, the longer length versions of these tubes have options for high and ultra high modulus carbon fiber, as well as choices for outer fabrics, such as colored Kevlar fabrics. The standard finish is cello-wrapped gloss, but a smooth sanded finish is also available. Braided carbon fiber tubes are comprised of carbon fiber braid and unidirectional fabrics. They offer excellent torsional characteristics, as well as crush strength, and are ideal for high torque applications. These carbon tubes are available in round, rectangular and square and can be axially optimized or made with higher modulus carbon fibers for increased bending stiffness. The standard for these tubes is our proprietary natural surface finish, showing a wet shiny appearance. Many can also be cello-wrapped for a glossier look, or even peel ply texture finish for improved bonding. Our large diameter carbon fiber tubes are comprised of rolled bi-directional woven carbon fiber. This tubing is designed for large applications, such as telescope projects or light weight drums. Our carbon fiber large tubes come with a texture finish on both the inside and outside for easy bonding and painting.